The South Slope's Sidecar keeps cooking 'til 4AM. Bar menu standouts: From the small-plates menu, try the crostini (chicken liver pâté rich with cream and a double whammy of port and brandy) or the brandade (salt cod + whipped potatoes + garlic cream = yeah). Split an order of intensely flavored gumbo on Monday, the only night they make it. Or get a banh de (an ode to the banh mi, and a Sidecar favorite since long before the Baoguette watershed) and have the kitchen slice it into wedges to share. It comes with a cucumber-juice shot for dipping. Genius. Washed down with: A Moscow mule (Oliphant vodka, lime and fresh ginger - one of the best versions of the mule we've had in town) or a Sticky Fingers (rum, ginger wine and syrup, and lime). Or the restaurant's namesake drink: Cointreau, Cognac, and lemon. Tip: If you've ever been peckish in Park Slope after midnight, you know what a pickle it can be: Most eateries shut down the kitchen round about 11PM. 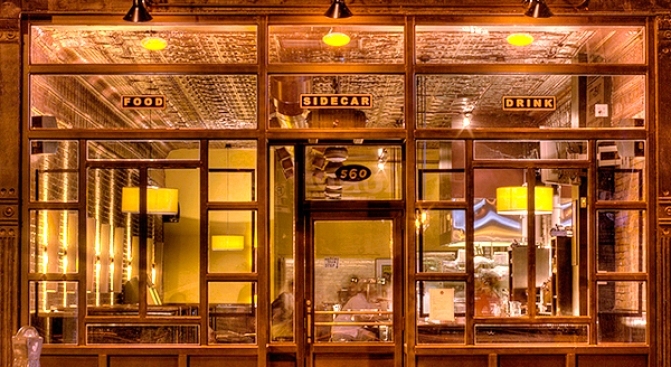 But at Sidecar, hunger is permitted well beyond that: The cooks call it quits at 4AM.